People care deeply about where they live. If you ever doubt that, remember this: they staged massive protests over a park in Istanbul. Gezi Park near Taksim Square is one of that ancient city’s most beloved spots. So in June, when Prime Minister Recep Tayyip Erdogan threatened to demolish the park to make room for his grandiose vision of the city as “the financial center of the world,” the park’s neighbors and supporters took to the streets. The protests were directed against what has been described as “authoritarian building”—the demolition of older, more-human-scaled neighborhoods in favor of denser high-rise construction, massive malls, and other iconic projects. Other protests, usually more peaceful, but sparked by a similar revulsion against gigantism, have erupted in cities as various as Sao Paolo, Singapore, and Los Angeles. But what is most striking are the eerily similar reactions of mayors, city planners, architects, and developers, all of whom seem remarkably tone deaf to the wishes of their constituents. There’s just one problem with this brave new condensed world: most urban residents aren’t crazy about it. In the United States and elsewhere, people, when asked, generally say they prefer less dense, less congested places to live. The grandiose vision of high-rise, high-density cities manifestly does not respond to the actual needs and desires of most people, who continue to migrate to the usually less congested, and often less expensive, periphery. And as the people’s desires continue to run counter to what those in power dictate, the urban future is likely to become increasingly contentious. Protests over urban development priorities similar to Istanbul’s occurred earlier this year in São Paulo, where the government is accused of putting mega-projects ahead of basic services such as public transport, education, and health care, particularly in the run-up to the 2014 World Cup and the 2016 Olympics. Singapore, often held up as a role model for densification, has seen growing concern about the destruction of historic structures, ever-more crowded subways, escalating house prices, and lack of open space. Similarly in Los Angeles, neighborhood councils have rallied against attempts to build denser buildings, which generate more congestion and erode local character. In London, too, attempts to build what the Independent describes as “the tall, the ostentatious, the showy and ‘iconic’” have been widely criticized for undermining the human-scaled nature ofLondon. Densification may be revealed religion to British planners, but this faith is not well accepted by citizens who live nearby. Novelist Will Self noted the “Wizard of Oz–hollowness” of these structures that seek to inspire but also “belittle us” with the mass, scale, and stand against this great city’s historic grain. Even in Manhattan, the red-hot center of American ultra-density, eight of the island’s 10 community boards oppose Mayor Bloomberg’s attempts to densify midtown. The midtown project has prompted Yale architect Robert Stern, a devoted urbanist and no opponent of density, to warn that too much high-rise development creates a dehumanized aesthetic that chases away creative businesses and tourists, while preserving older districts attracts them. The growing disconnect between people and planners is illustrated by the oft-ignored fact that around the world the great majority of growth continues to occur on the suburban and exurban frontier, including the fringes of 23 out of 28 of the world’s megacities. This, notes NYU professor Shlomo Angel in his landmark book A Planet of Cities, is true both in developing and developed countries. In Europe, immigration has slightly boosted populations in urban cores, but the flow of domestic migration still heads towards the periphery. The evidence is even more telling in the U.S. In the last decade, nearly 90 percent of all metropolitan growth in this country took place in suburban locations, up from the previous decade. At the same time, a net 3.5 million people left our largest metropolitan areas—those over 10 million—while the majority of growth took place in cities under 2.5 million. Between 2000 and 2010, a net 1.9 million left New York, 1.3 million left Los Angeles, 340,000 left San Francisco, and 230,000 left both San Jose and Boston. This is not what you read regularly in the New York Times or the Wall Street Journal. Young reporters, virtually all of whom live in dense, expensive places like New York or Washington, believe the world is the one they know first-hand, the one in which they and their friends reside. Yet most Americans are not young, highly educated Manhattan residents. Many downtown areas may have experienced a substantial boost in numbers over the last decade, but this accounted for less than 1 percent of the 27 million in population growth experienced by the nation between 2000 and 2010. The total population increase in counties with under 500 people per square mile was more than 30 times that of the increase in counties with densities of 10,000 and greater. All of this flies in the face of the argument, made by a well-funded density-boosting industry, that people want more density, not less. Lobbies to force people back into cities enjoy generous funding provided by urban land interests and powerfulmultinationals that build subways and other city infrastructure to bolster the cause of ever greater density. These interests speak about cities as if they were giant Lego constructions to be toyed with at the whim of planners or developers. But they neglect the things that matter to people in their daily lives: privacy, room to raise children, the desire for a backyard, decent schools, and safe streets. Roughly four in five home buyers, according to a 2011 study conducted by the National Association of Realtors and Smart Growth America, for example, prefer a single-family home, something that is anathema to the densifiers. Densifiers also claim their work makes cities richer, yet the nation’s greatest wealth-creator—Silicon Valley—is essentially suburban, and the world’s wealthiest metropolitan area—greater Hartford, Connecticut—is largely a collection of bucolic towns and suburbs with a density nearly as low as Atlanta’s. In addition, nearly all urban cores, including New York and Chicago, have considerably higher unemployment rates than their much-dissed suburban rivals. Overall, notes demographer Wendell Cox, 80 percent of the last decade’s urban population growthcame from people below the poverty line, compared with one third in suburbs. The new urban densification also shifts the role of the city from an aspirational model to what might be called the geography of inequality. Economists such as Ed Glaeser speak about density as an unalloyed factor in wealth creation, but they rarely factor in such things as cost of living, or in how such factors affect the middle and working classes. Glaeser’s favorite city, New York, is also America’s most unequal metropolis, where the 1 percent earn roughly twice as much of the local GDP than is earned in the rest of country, and where the average paycheck, when controlled for costs, is among the lowest among the nation’s 51 largest metro areas, behind not only San Jose, but Houston, Raleigh, and a host of less celebrated burgs. These inequalities are precisely what opened the door for the previously obscure leftist Bill de Blasio to make his impressive mayoral run. And Gotham’s great rival, London, according to one recent study, now may be the most unequal major city in the Western world. Yet rather than re-think density, planners and powerful urban land interests continue to force ever higher-density development down the throats of urban dwellers. In the already pricey San Francisco Bay Area, for example, municipal planners have embraced what is known as a “pack and stack” strategy that will essentially prohibit construction of all but the most expensive single-family homes, prompting one Bay Area blogger to charge that “suburb hating is anti-child,” because it seeks to undermine single-family neighborhoods. Perhaps the key measurement of social sustainability is the willingness of people to have children. Historically we fear overpopulation, but increasingly, at least in high-income countries, the real challenges may be over rapid aging and a diminished workforce. There is a countries, the real issue is now below replacement birthrates and rapid aging. High-density environments such as Manhattan, San Francisco, Seattle, Washington, D.C., or Boston invariably have the lowest percentages of children in the country, with Japan-like fertility rates (by 2050 there may well be more Japanese over 80 than under 15). The negative impacts of densification are even more evident in the fast-rising cities of the developing world, where most of new high-rise office and residential towers are being erected. In 1980 the world’s 10 tallest buildings were found in New York, Chicago, Houston, and Toronto. 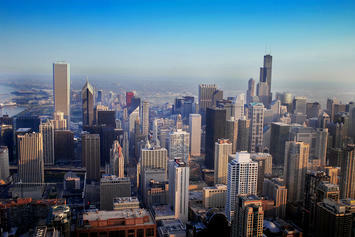 Today, only one building in North America—the Sears Tower in Chicago, built in 1973—ranks among the world’s tallest. The rest are located in Dubai, Mecca, Kuala Lumpur, Shenzen, Nanjing, Taipei, Hong Kong, and Shanghai, where the world’s second-tallest building is nearing completion. These towers symbolize Asia’s economic ascendency, but they also seem to diminish grassroots economies and discourage family formation. The ultradense cities of East Asia—Hong Kong, Singapore, and Seoul—have among the lowest fertility rates on the planet. Tokyo and Seoul now have fertility rates around one child per family while Shanghai’s has fallen to 0.7, among the lowest ever reported, well below the “one child” mandate and barely one-third the number required simply to replace the current population. Due largely to crowding and high housing prices, 45 percent of couples in Hong Kong say they have given up having children. Some Asian urban residents, if they can, now seek to leave these cities—among the most widely praised by urbanists—for more affordable and lower density locales. This is evident in rising emigration from China’s cities, Hong Kong, and Singapore, where roughly one in 10 citizens now chooses to settle abroad, mostly in lower density countries like Australia, Canada and the United States. To some, this boils down to an issue of health. Dense urbanization, notes a recent Chinese study, engenders more obesity, particularly among the young, who get less exercise, and spend more time desk-bound. Stroke and heart disease have become leading causes of death. These concerns have led, even in authoritarian China, to growing grassroots protests, many of them targeted at new industrial plants located near cities, including Shanghai. Rarely considered, however, is whether this form of urbanization creates a good place for people, particularly families. Korea is already among the unhappiest places on earth, according to a recent study by the Organization for Economic Cooperation and Development (OECD) and, not surprisingly, suffers a birthrate even lower than Singapore’s. Seoul is, as its boosters claim, fully modern but also both highly congested and aesthetically barren. The result, notes one recent Korean newspaper article is one of the most dehumanized and aesthetically unappealing cities on the planet. MIT architecture professor Lee Kwanghyun charges that over the past decade, development has effectively replaced Seoul’s once unique neighborhoods with seemingly endless blocks of 200-foot high white concrete boxes. Public opposition to this approach has been mounting, and Seoul’s city government recently suspended a “new towns” proposal that sought to knock down the city’s last remaining low-density areas. Not surprisingly, Koreans have been rejecting the hyper-dense core of Seoul, which has lost nearly 1 million residents (10 percent) in 20 years, with residents and migrants from elsewhere in the country heading for the relatively less dense suburbs. The damage done to people by megacity urbanism is most pronounced in poorer countries. My colleague Ali Modarres calls places like Tehran “cities of disappointment.” There, he notes, high housing prices and lack of space have already reduced the birthrate to well below the replacement level, a phenomena he also sees in such unlikely places as urban Tunis, Istanbul, and many otherdeveloping cities in the Islamic world. As in Asia, Modarres says, marriage rates are dropping and increasingly many women are choosing to remain single—heretofore something rare in these countries. In cities like Tehran, Modarres says, housing has become equated with living in a small apartment/condominium in a residential building. Rarely does the younger population think about housing in terms of a detached single-story building. And the exorbitant cost of housing in such a high-density city in turn creates constant worries about money and housing—having even one child is prohibitively expensive. Gigantism’s effects in the developing world—where much of the most rapid urban growth is now taking place—is even more profound. In Mumbai, home to 20 million people, life expectancy for city residents is at least 10 years below the life expectancy of their country cousins, even though urban residents have much better access to health care. And nearly four of five urban households complain about contaminated water. In 1971, slum dwellers accounted for one in six Mumbai residents. Today, they constitute an absolute majority. Indeed, much of the population of most developing country cities—such as Mexico City, Cairo, Jakarta, Manila, Lagos, Mumbai, and Kolkata, megacities all—continue to live in “informal” housing that is often unhygienic, dangerous, and subject to all kinds of disasters, natural or man-made. Moreover, many of these unmanageable megacities—most notably Karachi—offer ideal conditions for gang-led rule and unceasing ethnic conflict. Remarkably, many Western pundits find much to celebrate in megacities mushrooming in low-income countries. To them, the growth of megacities is justified because it offers something more than unremitting rural poverty. But surely there’s a better alternative than celebrating slums, as one prominent author did recently inForeign Policy. In the mainstream press, there’s even a tendency to engage in what one critic has labeled “slumdog tourism.” A recent National Geographic article, for example, celebrated the entrepreneurial spirit of Kinshasa’s slum dwellers, which is understandable, but underplayed the miserable conditions in which the majority of Kinshasa’s eight million residents are forced to live. That city, which Belgian researchers described as an example of “aborted urban development,” suffers from high crime, poor drinking water, and pervasive informal housing. Similar conditions exist in virtually all of Africa’s largest cities, which are growing as fast as any in the world. Rather than concocting sophisticated odes to misery, perhaps we might consider a different approach to urban growth. Perhaps we factor in what exactly we are inflicting on people with “pack and stack” strategies. Planners often link density with community, notes British social critic James Heartfield, but maintaining that “physical proximity that is essential to community is to confuse animal warmth with civilization.” When University of California at Irvine’s Jan Brueckner and Ann Largey conducted 15,000 interviews across the country, they found that for every 10 percent drop in population density, the likelihood of people talking to their neighbors once a week goes up 10 percent, regardless of race, income, education, marital status, or age. In 2009, Pew recently issued a report that found suburbanites to be the group far more engaged with their communities than those living in core cities. The primary goal of a city should not be to make wealthy landlords and construction companies ever richer, or politicians more powerful. Instead, we should look for alternatives that conform to human needs and desires, particularly those of families. Urbanism should not be defined by the egos of planners, architects, politicians, or the über-rich, who can cherry-pick the best locales in gigantic cities. Urbanism should be driven above all by what works best for the most people. This story originally appeared at The Daily Beast. Submitted by tom_8552 on Tue, 03/10/2015 - 08:23. A good informative post this url that you have shared and appreciate your work for sharing the information. Submitted by Wright Lopez on Mon, 11/11/2013 - 23:45. Leaders are the important members of the society as there should be a strong person to understand the exact requirement of different society. This will help us in a great way and prominently leaders would be more benefited towards this scheme and this will be more helpful regarding the development of the city, and society which we are living in. Submitted by rickrybeck on Wed, 09/18/2013 - 09:45. If density is so great, why does it seem that people rebel against it? When people "vote with their feet," they are often voting with their wallets. Returning to Yogi Berra, if nobody liked or wanted density, the cost of real estate in city centers would be nominal. Real estate in city centers is valuable because people value those locations. Unfortunately, a few wealthy and powerful landlords monopolize these locations and charge outrageous access fees (rents) to those who want to live or work in there. Another commenter noted that, in the USA, the automobile and the roadway network broke the stranglehold of the downtown landlords. But this came at a tremendous cost to the environment and to our municipal budgets which must now support 10 times as much infrastructure as would be required if we lived more compactly. Fortunately, there is a solution that does not involve the automobile and converting our land into roads and parking lots. City-center locations are valuable because public goods and services and the collective work of the entire community make these places among the most productive places to live and work. By employing "value capture" techniques that return publicly-created land values to the public sector, some communities have taken some of the profit out of land speculation. This reduces the speculative demand for land and helps keep land prices more affordable. Simultaneously, these communities have reduced the tax on privately-created building values. The net result is more affordable buildings AND more affordable land. This is good for residents and businesses alike. So, when promoting smart growth, I never use the word "density." Instead, I use the words listed above that are the desirable things that density can produce. And, to make it affordable, I recommend a combination of user fees and value capture to internalize economic externalities and create economic incentives that are more harmonious with public policy objectives for job creation, affordable housing, transportation efficiency and sustainable development. Submitted by PhilBest on Fri, 09/20/2013 - 15:37. "....Another commenter noted that, in the USA, the automobile and the roadway network broke the stranglehold of the downtown landlords. But this came at a tremendous cost to the environment and to our municipal budgets which must now support 10 times as much infrastructure as would be required if we lived more compactly....."
Where is the analysis that shows the level of difference between dense and dispersed urban form is this severe? The "Costs of Sprawl 2000" report suggested that the difference was $80 per household per year. The economic land rent avoided, is thousands of dollars per household per year. And this report did not take into account the higher long term cost of infrastructure maintenance and renewal and expansion under conditions of higher density. The greater difficulty of access, disruption, and acquisition of land. The "length of runs" of pipes and wires and tarmac is only one factor. It is perfectly logical that you can have higher costs of pipes, wires and tarmac and yet lower costs overall. Any cost accountant would understand this. Pollution is always higher for the residents themselves in higher density. This is what matters. The impact on humans, not the impact on the Gaia Earth Mother. I agree in principle about "value capture" but this can and will be be abused. Land value taxes are a just and objective way of linking value with revenue. This happens automatically without help from politicians and planners. Politicians and the rentier classes hate land taxes for good reason. They remove the opportunity for pork. I strongly recommend Mason Gaffney's 1964 "Containment Policies for Urban Sprawl". Your intuitions are correct about lowering taxes on structures. Gaffney recommends their total abolition in favour of LVT. This would contain urban growth by efficient free market function, not political and utopian ideological interference that has unintended consequences. I am pleased that your understanding is so far ahead of most advocates, in that you see that the valuable amenities of "urbanity" are rationed by real estate markets in terms of who gets to live at the best-served locations. But the solution is not centralisation, it is dispersal of those amenities. This is what happens anyway when you let it. The New York urban area with its 20 million people does not have its "urban amenity" concentrated in Manhattan. There are plenty of other nodes with everything that anyone could want. I have lived all my life, in locations miles from the centre of the urban area, that were still "walkable" and had every amenity I would want to access by walking. Interestingly, I do not notice much Real Estate market price premium effect for such locations. The quality of the homes and the neighbours has much more impact. Demand for such locations is obviously already well matched with "supply" of them. The planners dilemma is this. They are obsessed with mass public transit as an end in itself. This requires centralisation, to be viable. This is the tail wagging the dog. If we step back, ask what are the actual ends we are wanting to achieve, we would see that we can achieve them by duplication of the clusters of amenities we want, not concentration of them; good design, and an increase in walking as a mode share. There is at least as much potential for this as there is for an increase in mass transit ridership, and the walking mode costs the taxpayer nothing. Highly costly "transit oriented" planning actually tends to undermine the potential for completely free walkability. The irony is that a chaotic small-vehicle public transport system that could serve a highly dispersed urban form, like Manila's Jitneys, is just as efficient as subways anyway. There are also numerous "sustainable" ways of living that require a bit of flat land around a home - geothermal heat pumps, burning biomass for heating and cooking, growing your own food, drying washing outside, collecting rainwater, active and passive solar heating, using trees for shade, composting and recycling. The environmental movement was keen on all this stuff 40 years ago. What happened is that this movement has been taken over by haters of freedom, property rights, and "global capitalism". They don't actually care about humans or the environment at all. ".....Finance is the only major industry left in post-modern Britain...."
Submitted by PhilBest on Mon, 09/16/2013 - 21:12. I am very interested in what you point out, that the numbers of slum dwellers in developing country cities tend to have been increasing. "....The primary goal of a city should not be to make wealthy landlords and construction companies ever richer, or politicians more powerful..."
And this is the problem in those developing nation cities. The first world solved this problem with competitive automobile based development that drastically reduced economic land rent. This had numerous beneficial spin-off effects on society and the economy. If developing nations keep going down the path of wealthier and more powerful landlords and politicians, they will never catch the first world, and will end up with a revolution or something due to the exclusion of so many people from opportunity. But "smart growth" in the first world is like a retrograde step back to the pre-automobile third world. They have slums, we have "sub-prime mortgages". The UK is demonstrating what happens in a "developed" nation when you constrain urban growth. Economic land rent is around 300 times higher now than it could be - compared to, say, Houston. There are Council officials flying around at night with infra-red cameras trying to catch out all the people sleeping in "non approved housing" - like garages and garden sheds. I call this "Marie Antoinette Urban Planning". Submitted by C. P. Zilliacus on Mon, 09/16/2013 - 18:23. ... efforts aimed at "preserving" farmland in developed nations (where there is not all that much need for such preservation of agricultural land); and efforts to force as many residents as possible onto mass transit (which has not always worked as expected). Submitted by molson360 on Mon, 09/16/2013 - 15:16. "the nation’s greatest wealth-creator—Silicon Valley"
That is until the Financiers funnel the wealth into some other industry. Computer Tech is just like any other technology industry and is becoming commoditized as it matures. Silicon Valley is more a testament to cold war industries located on the Pacific theater than low density planning. If anything Higher density should be linked to national security. The less people we have driving 3000 LB. vehicles to go buy a loaf of bread the more stable our economy will be not being a direct function of the price of oil. Maybe some of that computer tech money should funnel into a smarter auto industry or urban planning instead of the next pointless phone app. Density is the Procrustean "solution"
Submitted by PhilBest on Mon, 09/16/2013 - 21:05. Higher density = national security? Come on, back in the 1950's it was commonly understood that a dispersed population was far less vulnerable to WMD attacks. Actually, the price of oil is not the price of petrol, the price of petrol is not the price of driving, and the price of driving has pretty much flatlined in REAL terms for decades. In fact, the cheapest option for automobility now is probably a lot lower in real terms than it was a few decades ago. This is because small, lightweight, economical cars are now so much more mechanically reliable and have a much longer service life. A second hand small Asian hatchback will give far lower real cost of motoring than what anyone could have got 50 years ago from a small British or French car. And we've pretty much got the cost of automobility licked now, because we have reached a kind of plateau in the price of oil and substitutes; the higher the price goes, the more there is. Density is the Procrustean "solution". There are far more ways of living sustainably at low density than there are at high density. Submitted by lyle on Mon, 09/16/2013 - 22:29. Starting with natural disasters many of which tend to be localized such as floods and tornadoes. Then as the post points out lower density reduces the threat of WMD attacks and other terrorist acts such as dirty bombs. In the US at least there is no shortage of land, given that the US has more forest now than 120 years ago. In addition a number of smaller towns are shrinking a number of them have vacant lots which in a small town is a measure of how well the town is doing. Submitted by PhilBest on Wed, 09/18/2013 - 01:00. Absolutely correct to point out the "natural disaster" angle too. It certainly was not "smart" of Boulder Colorado to do high intensity and highly paved surfaces right where every major flood was going to go. "Smart growth" is actually very dumb. There are cases like this all over the world - "smart growth" on fault lines, flood plains, etc etc.